Based on all of the iPhone 6 dummy units we’ve seen, this rumored design closely resembles Apple’s fifth generation iPod touch, but that’s not all. As shown in the video below, the alleged iPhone 6 design looks very similar to another flagship smartphone released this year. 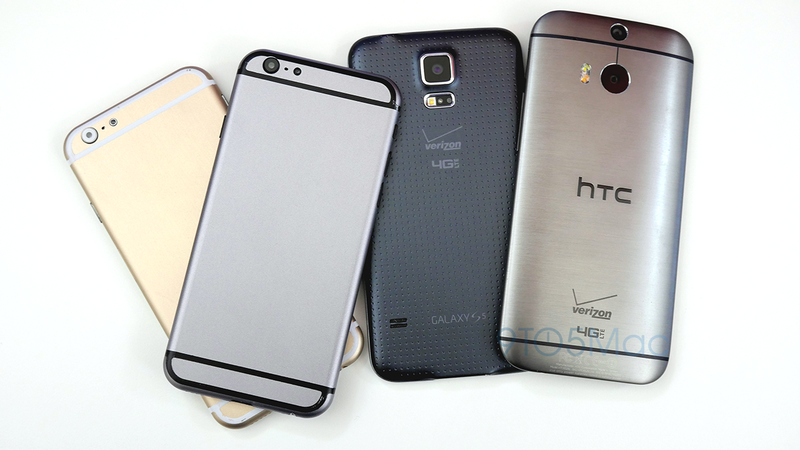 The HTC One M8 and iPhone 6 mockup look like cousins or long-lost brothers when it comes to their design. Of course there’s no confirmation that Apple is actually using this design for the iPhone 6, but almost all of these mockups have been manufactured based on “leaked” schematics and specifications. The rumored 4.7-inch display, thin body style, and curved edges make this mockup look very similar to the HTC One M8, but it’s also possible that Apple took design cues from other Android smartphones like the Samsung Galaxy S5. The lock/power button has been moved to the side of this mockup and is likely there to accommodate the larger screen size and provide easy access when using the device with one hand. All three devices share similarities in size and thickness, but the iPhone 6 is very close in dimensions when compared to the Galaxy S5. Obviously, the Galaxy S5 has a bigger 5.1-inch display, but Apple won’t be too far behind if the iPhone 6 ships as a 4.7-inch model. If I were to compare the display size of this dummy iPhone 6 to another Android smartphone, the best possible option is the Moto X. Apple’s iPhone 6 is expected to be unveiled later this year and then we can finally put an end to all of these rumors. Thanks to Sonny Dickson for helping us get a hold of these dummy units.